American Quarter Horses are renowned for their speed, agility, and calm disposition. Consequently over four million Quarter horses are used as working horses on ranches, as show horses or at rodeos. New research published in BioMed Central's open access journal BMC Genomics used 'next-generation' sequencing to map variation in the genome of a Quarter Horse mare. 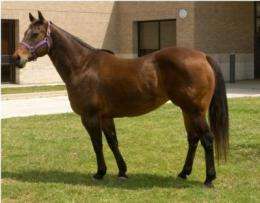 Analysis of genetic variants associated with specific traits showed that compared to a Thoroughbred the Quarter Horse's genome was enriched for variants in genes involved in sensory perception, signal transduction and the immune system. Quarter horses have been selectively bred to improve speed over short distances. However they also prone to some disorders such as hereditary equine regional dermal asthenia (HERDA) where their skin is fragile and tears easily. Researchers from Texas A&M University sequenced a Quarter Horse genome with the aim of finding what makes these horses so special. They looked at genetic variants, including single nucleotide polymorphisms (SNP), copy number variants (CNV), insertions and deletions (INDELs), as well as mutations associated with performance traits and diseases which are responsible for the makeup of these horses. By comparing the Quarter Horse's sequence with that of a Thoroughbred, over three million of these variations were found. With the help of a human gene identification library, pathways, traits and diseases associated with the variations and mutations found in the horse were identified. Dr Scott Dindot from Texas A&M University College of Veterinary medicine explained, "When we compared the genomic sequence of our mare to that of a Thoroughbred genome, we found that the Quarter horse had more genetic variation - especially in genes involved in sensory perception, immunity, and cellular processes. When we looked for disease causing mutations and variants associated with performance traits we discovered that the Quarter Horse was heterozygous for a mutation in the cyclophilin B gene which is responsible for HERDA, and a SNP associated with chestnut coat color. The horse also had SNPs associated with racing endurance, originating in Thoroughbreds, which may explain the Quarter Horse's speed and stamina." The sequencing of horse genome has been of great benefit to equine breeders and veterinary medicine because of the possibilities of improving health and performance. This information can also be used to understand the theory underlying horse evolution. Recently mitochondrial sequencing of domestic horses and a Przewalski horse was able to show that most of the genetic variation between modern breeds was already present in ancestral stock. This new research, the first to use next-generation sequencing, has provided information which will be a useful resource in understanding the genetic basis behind horse breeds and disease.